I'm running on re71-r tires (235/40r18 and 265/35r18) and have been playing with my hot pressures, bleeding as necessary when I come off the track. What are your experiences and what do you aim for in hot pressures? I have never driven those tires, but lately I have been shooting for 35-36 hot on all 4 corners based on a tip I got from a Cayman guy. This had worked well on the tire I have used it with which were Hankook R-S3, Nitto NT-01, and Maxxis RC-1. I've tried lower, 32f 34r which also felt good, going below that and the outer edges get too much wear especially in the fronts. It usually takes me 2 sessions to get them set, bleeding down as soon as I come in from the cool down lap, and the left side (on clockwise tracks) is usually 1-3 psi higher the first session or two until I get it sorted. Bob Woodman told me to bleed down to desired temps as soon as I come in, it has been working good so far. What have you been running and how does it feel? 35 square feels good and good even tire wear for me. You can set the system to a max pressure you want and kind of just go with it. I am trying this setup today and tomorrow. So far, it seems to be working well. Thanks for your input Steve! Why not just get a set adjustable tire pressure relief valves and it will always keep your tires from exceeding a set pressure? Those sound pretty neat, but what if you have an error and make a big slide and temporarily overheat the tire, raise the pressure which is then released by the automatic valve, then the tire cools down and you are now too low. To the extreme, this lowered pressure could increase friction and heat, raising the temp more, pushing out more air. Etc. also seems like an extra part to fail and then.let all the air out. Although I never used the tire pressure relief valves myself, the guys I knew that used them liked them a lot. Most of them that used them had used them racing on ovals, and never reported having any issues with the pressure relief valves. One slide is unlikely to raise the pressure enough to cause it to bleed the air, so they are consistent with maintaining pressures. Good to know, they do sound very convenient. Anybody on here tried them? Its not always as simple as "set and forget". For example, in the fall the high temp will be mid-day but late afternoon sessions/races could be quite a bit cooler and that may actually require that you add air in order to get the tires to the optimal pressure. If you rely solely upon the pressure relief valves, then you could be under pressure for the latter/cooler part of the day. 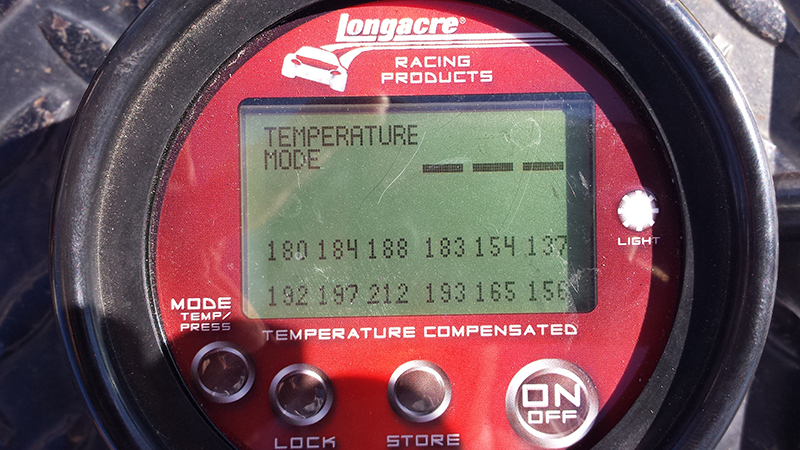 The best way to set pressure is to check tire temps across the face and adjust accordingly. While ideally you would have someone do this in the hot pits during a session, you can do this immediately after a session and get a decent feeling for where your temps are at. Will also help you with setting camber, toe etc. I run much lower temps than most - I run at 26 front and 28 rear hot - but i'm also running 245/40/18 and 275/40/18 f and r respectively. I've based this on the log book of the previous owner as well as tire temps across the face. i'm at 34/36 hot on nittos - 245/40R18 and 275/35R18. ran a bit less pressure on yoko ado8s. ditto check temps as soon as i get into the pits. too much air and you'll ride on the centre of your tire - reduce contact patch - cook your tire in the middle and get greasy quick. too little pressure and you will start rolling onto your sidewalls and, again, greasy. lots of variables - temp of day, length of session, type of track surface, tire compound, tire sidewall design, etc. also with car setup - weight, front/rear balance, sway bar settings, etc. - tire pressure is yet another way to 'tune' your car. pyrometer is a good way to ensure you are not cooking the centre of the tire and chalking your sidewall to confirm how much you are rolling over is another. also just keep an eye on how your tires are wearing - sidewall wear markers, centre vs edge wear bars. Here's an old video -starting about 3 minutes into it. I haven't found a good place to do this with my car, but I suppose it's just about as good as having someone stand by in the pit after a couple laps of the track to check. I ran my Proxes R1R's this past week at a track day. 31 warm on all 4 (I say warm because i have to drive an hour to the track). 31 warm became 36 hot after each session. The car was very sticky on a 78 degree day. As The Rad King mentioned, the correct tire pressure needs to achieve two different goals at the same time: proper inflation (even pressure across the width of the tire/proper roll in corners) along with optimizing tire temperatures. The best way to get the inflation pressure correct is to use the sidewall markers (little triangles) to detect how far the tire is rolling over in corners. Decrease pressure if wear is not close to the markers (to let the tire rollover more) or increase pressure if wear is past the markers (to stiffen the tire and reduce rollover). Then use a pyrometer to measure tire temps and adjust pressure as needed to get the tire temp to the optimal temp range. Last edited by thstone; 09-23-2017 at 03:43 PM. Hey NewArt - Those RE-71r's are well known to have very stifff sidewalls compared to any other 200 TW tire. As a result they like lower pressures to achieve the same temperature profile as others. I usually ran mine around 32 psig hot. In my experience, they give up the ghost if pressure rises over 36 psig.